We read with interest the article in the June 2017 American Journal of Neuroradiology by Wallace et al entitled, “Percutaneous Spinal Ablation in a Sheep Model: Protective Capacity of an Intact Cortex, Correlation of Ablation Parameters with Ablation Zone Size, and Correlation of Postablation MRI and Pathologic Findings.”1 The researchers postulated that an intact cortex appears to protect against radiofrequency ablation-induced spinal cord injury, but not against non-impedance-based modalities. This conclusion is an important consideration in the treatment of spinal metastases with bipolar radiofrequency ablation (RFA). In agreement with the accompanying commentary by Gemmete,2 we believe that more animal research with bipolar RFA systems is needed, in contrast to monopolar RFA. The main limitation of the study, as Wallace et al1 stated, is that the research was performed with normal bone, which is unlike the typical clinical situation. To strengthen the aforementioned conclusion and solve the limitation of the study, we present our preliminarily results as supportive data. Tumors are known to affect the posterior vertebral cortex (PVC).3 An insulating effect of the PVC during monopolar RFA has been reported.4 Others have postulated that RFA should only be performed on patients with an intact PVC and not too far advanced osteolysis.5 No research regarding the effect of a PVC defect on temperature distribution during bipolar RFA in the spinal canal was found during our literature review. Thus, we performed our ex vivo research. 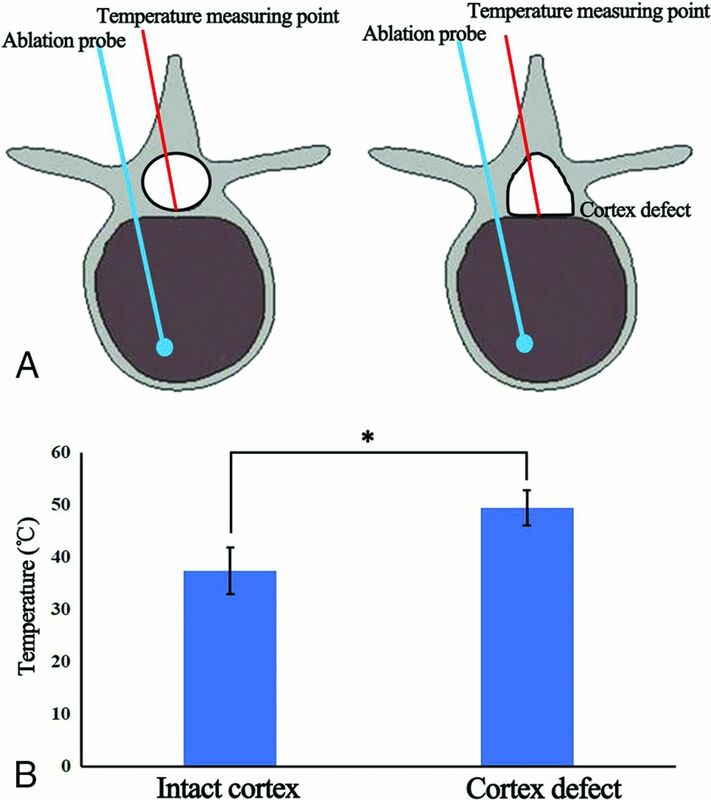 A preliminarily evaluation of the temperature distribution change during bipolar RFA in the spinal canal in porcine lumbar vertebrae was performed. As shown in Fig 1, lumbar vertebrae from 10 pigs were collected and randomly divided into 2 groups (4 lumbar vertebrae per group). Group 1 was the intact cortex group; and group 2, the cortex defect group. The PVC defect was achieved by removal of the cortex with a rongeur. We used a radiofrequency generator connected to an expandable electrode catheter (1500X; AngioDynamics, Latham, New York) for the ablation. An infrared thermometer system (CTlaser LT; Optris, Berlin, Germany) was used to monitor the temperature. The highest temperature during RFA was recorded. RFA was performed on each sample for 15 minutes at the 75-W setting and 95°C. The temperature (37.43°C ± 4.43°C) in the intact cortex group was noted. A significant increase (49.44°C ± 3.34°C) was seen in the cortex defect group (P < .01). Our data suggest that an intact PVC provides thermal isolation during bipolar RFA. For the cases with altered PVC, bipolar RFA is still a potentially safe therapy. The effect of the posterior vertebral cortex defect on temperature distribution in the spinal canal during bipolar radiofrequency ablation. We offer these preliminary data suggesting that an intact PVC can potentially protect against RFA-induced spinal cord injury. We show changes in the temperature distribution within the spinal canal of the samples with PVC defects during bipolar RFA.